Navy, Air, Army, RNZRSA, RSA, NZCF, Cadet Forces, Deployment, ANZAC Day, Gallipoli, Turkey, People, Parade, Veterans: The NZDF deploys to Gallipoli, Turkey for the 95th Anniversary for the battle of Gallipoli in 1915 where the ANZAC's 1st fought together. Joining the NZDF are veterans, school students and cadet force representatives. The CDF, Chief of Defence Force LTGEN Jerry Mataparae and Minister of Veterans Affairs Rick Barker are also in attendence. 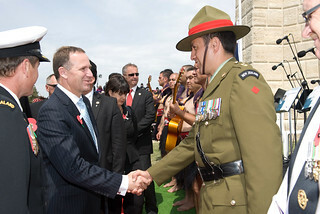 PM of NZ meets Master of Ceremonies LTCOL Glenn King at Chunuk Bair.